New iPad owners can now access their files from anywhere through RhinoSoft's Serv-U FTP Server. Serv-U's newest web-based interface allows iPad users to view photos, thumbnails and documents online and get access to their work files when out of the office. 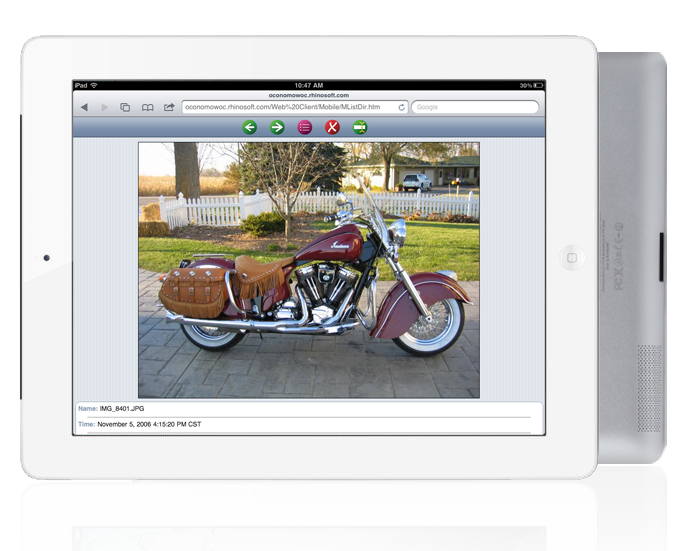 iPad users can flip through images hosted by Serv-U. Serv-U is about the only secure file transfer server committed to supporting mobile devices such as the new iPad. With the new iPad in stores this week quick-thinking software companies are already finding ways to tie them into existing business processes. One of those companies is Wisconsin-based RhinoSoft, who announced iPad users can now access their files from anywhere when using Serv-U's mobile-optimized interface. "We're tech junkies working for a tech company so we all have our iPhones, our iPads and now a higher-resolution iPad," said Jon Voss, the RhinoSoft developer leading his company's iPad initiative. "Like thousands of other companies we also use Serv-U to access our files on the server when we're on the road. From that perspective, supporting Serv-U on the new iPad was a complete no-brainer." Serv-U's iPad interface is a mobile-optimized version of Serv-U's existing web transfer interface. iPad users may view photos, documents and thumbnails online, or they may download and delete files remotely. All access is controlled by Serv-U administrators or inherited Active Directory permissions and all transfers can be encrypted using 128-bit or 256-bit HTTPS. On the back-end Serv-U frequently integrates with file shares, NAS, and SANs. When combined with Serv-U's zero-app interface, that capability means that most business users can securely access their work files from any iPad as soon as they leave the Apple Store. "Right now, Serv-U is about the only secure file transfer server committed to supporting mobile devices such as the iPad," said Jonathan Lampe, RhinoSoft VP of Product Management. "Whether it's IPv6 support, 64-bit performance or news about iPad support, the market has grown to expect innovation from Serv-U." In addition to the iPad, Serv-U already supports secure file transfer and online document viewing on Apple's iPad, iPhone and iPod and other mobile devices such as Google's Android phones, Amazon's Kindle Fire and RIM's BlackBerry. Support for mobile-based iPad administration is planned in for Serv-U version 12 release next quarter. RhinoSoft (RhinoSoft.com) is the global leader in affordable file transfer, with more than 90,000 business customers, including nine of the Fortune 10, in 90 different countries. Its award-winning and U.S. Department of Defense-certified Serv-U FTP Server and FTP Voyager client products support FTP, SFTP, FTPS and web-based HTTP/S secure file transfers over FIPS 140-2 validated channels while continuing to incorporate emerging technologies such as mobile computing, IPv6, native 64-bit computing and UTF-8/Unicode internationalization. iPad®, iPhone® and iPod® are registered trademarks of Apple, Inc. Android™ is a trademark of Google, Inc. Kindle™ is a trademark of Amazon, Inc. BlackBerry® is a registered trademark of RIM, Ltd. Serv-U® and FTP Voyager® are registered trademarks of Rhino Software, Inc.
A list of Serv--U folders and files, with thumbnails, as seen on an iPad. Flipping through images hosted by Serv-U on an iPad.